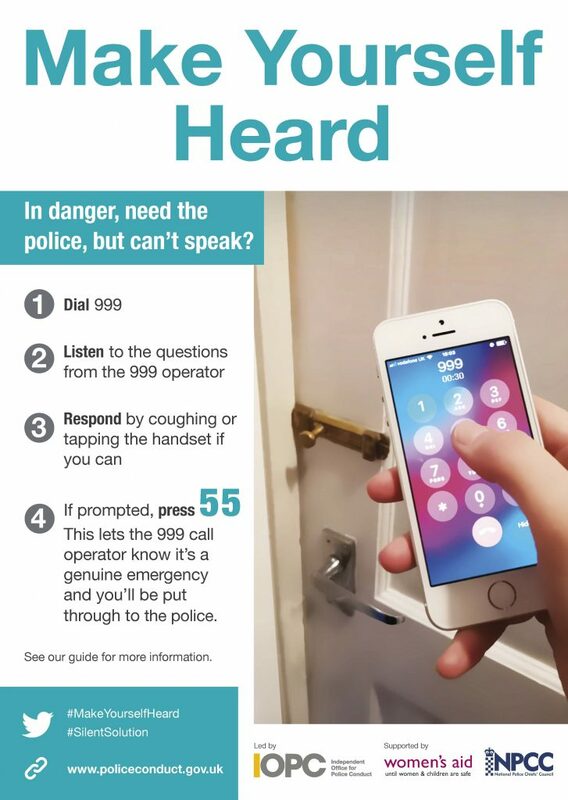 If you need urgent help from the police but are too scared to speak there’s a way for you to still get help by calling 999. All 999 calls go to call centres and are answered by BT operators. They’ll ask you which service you need. If you don’t request police, ambulance, or the fire brigade and the operator is concerned they’ll connect you to your local police control room call handlers. It’s always best to speak to the operator if you can, even by whispering. You may also be asked to cough or tap the keys on your phone in response to questions. If making a sound would put you or someone else in danger and the BT operator can’t decide if you need an emergency service, they’ll transfer your call to the Silent Solution system. You’ll hear an automated police message, which lasts for 20 seconds and begins with ‘you are through to the police’. It will ask you to press 55 to be put through to a police call handler. The BT operator will remain on the line and listen. If you press 55, they’ll transfer the call to your local police. If you don’t press 55, the call will be ended. Pressing 55 does not allow police to track your location. When transferred to your local police force, the police call handler will attempt to communicate with you by asking simple yes or no questions. If you’re not able to speak, listen carefully to the questions and instructions from the call handler so they can assess your call and arrange help if needed. Because it’s less likely that 999 calls are made by accident from landlines, the Silent Solution system is not available. If, when you call 999 you don’t speak, and the BT operator can’t decide whether you need an emergency service, then they’ll transfer your call to a police call handler. If you replace the handset, the landline may remain connected for 45 seconds in case you pick it up again. If you pick up again during this 45 seconds and the BT operator is concerned for your safety, they’ll connect you to the police. When 999 calls are made from landlines, information about where you’re calling from will be automatically available to the call handlers to help them to help you.